Monasteranenagh was founded in 1148 by Turlough O’Brien, King of Thomond. Donal Mor O’Brien became patron of the abbey after Turlogh’s death. It was a daughter house of Mellifont and subsequently established three daughter houses of its own: Abbeydorney (1154); Midleton (1180); Holycross (1181). Its name derived from ‘Manister an Aonaigh’, the monastery of the fair, after a fair that was held at the site in ancient times. Its Latin name represents the latinisation of the local river: ‘Magium’, from the river Mague. It seems the monks were aware of the problem of flooding and they built their monastery a little way from the river, on a section of slightly raised ground. The abbey was heavily involved in the ‘conspiracy of Mellifont’ and in 1227 affiliation of the abbey was transferred to Margam in Wales. In the following year the Irish monks forced the abbot and the non-Irish monks, who were mainly of Norman descent, to leave the abbey. The remaining monks attempted to prevent Stephen of Lexington from visiting the abbey by fortifying the precinct; they prepared the abbey for siege, turning it into a castle and building a tower above the altar. The ring leader was the King of Thomond, who resented the presence of the Anglo-Normans in Ireland. Stephen of Lexington is known to have said that the monks of Monasteranenagh had ‘drunk from the chalice of Babylon’. The community was excommunicated for revolting against their ecclesiastical superiors. Herbert de Burgo, the bishop of Limerick, eventually recaptured the abbey and reinstalled the monks who had been driven out. The rebellious monks who returned and asked for mercy were absolved. By the end of the thirteenth century the abbey had fallen heavily into debt, owing £209 to the Ricardi de Lucca in 1302. Monasteranenagh is thought to have been one of the richer Cistercian monasteries although no reliable financial figures survive. The abbey was suppressed in 1539-40, and the property was granted to Sir Osborne Echingham in 1543. However, the monks were left in possession of the abbey which they retained until 1580. Some of the monks who were expelled from affiliated abbeys in 1540-2 are said to have joined the community at Monasteranenagh. 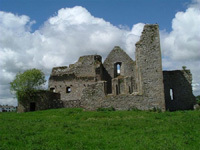 Monasteranenagh was the scene of a major battle during the Geraldine rebellion of 1579-1580. In 1579 Sir William Malby led the English into battle against the Irish and the Spanish. The Irish army was led by Sir John of Desmond. After being defeated, the Spanish and Irish soldiers took refuge in the abbey. The English army turned its guns on the abbey and captured it. It is said that the abbot was beheaded on the altar steps and that forty monks were slain within the precinct; the tale, however, lacks reliable evidence. Malby then burned the abbey causing much damage: the Cistercian community at Monasteranenagh was no more. The buildings were further damaged in 1585 when it became the property of Sir Henry Wallop. He plundered and robbed the abbey of all its valuables and left the ruins to decay. Today, the ruins include the church (which dates from 1170 to 1220) and an early Gothic chapter house. The walls, gables and the main window frame of the church are all extant. The tower fell in 1806-7; it was thought to have been either the crossing tower of the church or part of a sixteenth-century house that was constructed over the south transept. The interior of the abbey was used as a burial ground until the 1970s. A short distance from the abbey is another set of ruins which appears to be the remains of the old guesthouse. The ruins are situated on a flat plain, ten miles south of Limerick, and can be accessed by the public at all times.